October is great time to get children fired up about fire safety. Give preschoolers a better understanding of the role a fire plug plays in putting out fires by helping them to make preschool crafts of a fire hydrant that also teach important fire safety rules. After going over basic fire safety rules, explain to children that a fire hydrant is where the fireman gets the water to put out a fire. The fireman attaches his hose to the fire plug, which has underground pipes leading to a water tower. Once the hose is connected and the water is turned on, it comes rushing into the fire plug and through the hose to put out the fire. Firefighters use special wrenches to open the nut on the fire plug. These nuts can be in the shape of a pentagon, octagon, triangle or square, but the most common shape in the United States is the pentagon or octagon. Without fire hydrants, it would be impossible for firemen to put out fires. This is why city and local governments place them all over town. 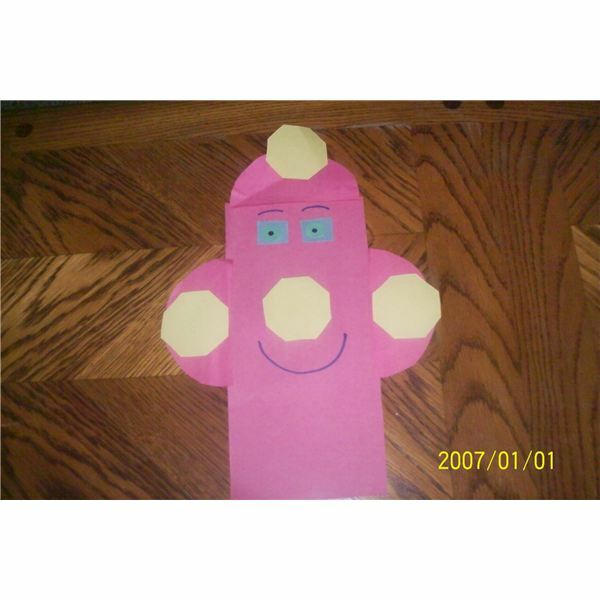 Preschoolers review shapes and learn that the nuts on a fire plug are shaped like a pentagon or octagon while making this craft. Review the shapes, and then tell the children that they are going to make a fire hydrant out of the shapes. Show the children an example and have them glue the shapes together. Using markers, add a mouth and eyebrows. Show the children where the hose attaches to the fire hydrant. Explain that the fireman has to use the special wrench to take off the octagon or pentagon nut before he can put the hose on the fire plug. When finished, the teacher helps the students come up with ideas for describing a fire, fire hydrant or safety rule and writes it on the bottom of their craft. For example: "Fire is hot," or "Fire hydrants provide water for firefighters." Explain what 911 is and when we should call it. Next, tell children that fire hydrants are located all around the city to help firemen put out fires. Sometimes people try to make fire plugs look more attractive by painting them to look like animals or cartoon characters. Show children pictures of a variety of painted fire hydrants. Preschoolers can make a Dalmatian dog fire hydrant puppet (or whatever character they choose). The children glue the shapes onto the white paper bag and write 911on the yellow octagon. Next, invite them to draw a mouth, eyes and eyebrows with a black marker. Last, they will paint black spots on the dog with their fingers. 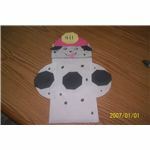 The puppet can then be used to explain fire safety or act out a fire safety escape plan. Children learn where a hose attaches to a fire hydrant and review fire safety rules while making this craft. Draw a fire hydrant on a white piece of paper or print one out. Make sure the fire plug image is located to the far left of the paper so the children have room to make "fire" and "water". Give one paper to each student. Invite the children to dip their fingers in the orange, red and yellow paint to make "fire" on the white paper. Next, give each student a piece of tinfoil and blue paint. 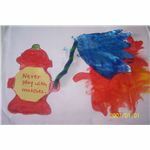 The children use finger-paint to make the foil blue and color the fire hydrant with a red marker or crayon. Let the project dry. Next, help the preschoolers to glue a straw or pipe cleaner (hose) to their fire plug. Help them to cut out their blue tinfoil (water) and place it so it appears to be spraying out of the hose. Review the fire safety rules and give each student a rule written on a yellow pentagon to glue on their fire hydrant. The pictures would make a great fire safety bulletin board. Encourage children to learn about fire safety this October. Making these easy preschool crafts of a fire hydrant are a fun way to encourage creativity while teaching preschoolers important safety rules about the dangers of fire. Before making the crafts, read books, sing fire safety songs, and engage children in activities that reinforce fire safety rules. Ideas, Images and Crafts by Lisa King all rights reserved.